I love Goodreads Year In Books, I love to see other people's years in books as well. Since we share our years in books at my Bookclub, I thought it would be so cool to view other bloggers Year In Books as well. I got inspired by the awesome page where you can view your Year In Books, by Goodreads! So why not create a yearly-meme?! You can decide how you share your year in books, there are no rules on the post, or on what you share. Be creative and show the things you're proud of! I was inspired by The Caffeinated Book Reviewer , who organizes The Sunday Post, every Sunday! 1) Write your own Your Year in Books post. 3) Enter the link of your post in the widget. 4) Tag your friends (if you like). 5) Check back to enjoy other people's posts! 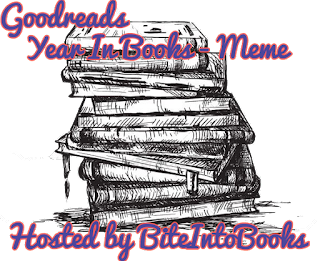 This years (2018) Your Year in Books MEME page is HERE.